We leave from platform 14, which is right on the edge of Paddington station. 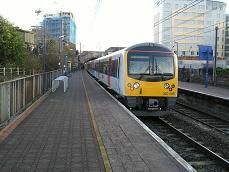 It's a slow stopping shuttle train that runs every half hour, so we pass through Acton Main Line and Ealing Broadway before we arrive at West Ealing, the junction station for this line. The station sign proudly announces that West Ealing is "The home of the Pastie ? Company" with a giraffe as it's logo. There are two platforms north of the main line and each has a bus stop shelter. We leave the mainline straight away and go in a north westerly direction over a level crossing and past the National Railway maintenance building, before joining a spur line that come in off the main line from the west. We then arrive at Drayton Green, which has a large modern shelter on one platform. We leave the station and go into a tunnel, before emerging at Castle Bar Park. It has two bus stops and not much else, though next to the station is a very colourful Community Centre. We move onto an embankment and get a wide view of West London, which is mainly housing, though the arch of Wembley Stadium can be seen not far away on the right. Briefly there's some greenery with some sport's fields and an athletics track. We then come into South Greenford, which is still high up on an embankment looking down on the shops below. It has two bus stop shelters. We then go over the busy A40 and into semi-deatched suburban land. A tube train on the right comes into view as we join up with the Central Line and the old GWR from Paddington. We then slowly come into Greenford station which is an island platform, with a bay for our train in the middle of it. You can only get off on one side though. the train only waits four minutes and then pulls out again, during which two tube trains arrive and leave going south in this short space of time.